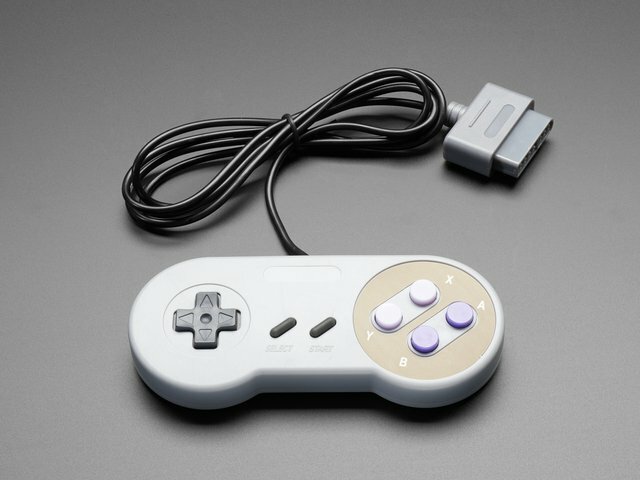 We'll begin by disassembling the SNES controller. There are 5 small phillips screws on the back. Once you lift the back off, you can remove the PCB. Be careful as there are tiny wires for the 'side' buttons so just make sure those pieces come out cleanly. Each button is made of 3 parts - theres the plastic part that you press, beneath that is the elastomer which is a rubber molded piece with a conductive bit that goes underneath the plastic part, and finally on the PCB there are two interdigitated and exposed traces. When the user presses the plastic button, it pushes down on the elastomer which then pushes the conductive rubber onto both traces, shorting them. Well, luckily, almost all game pads are going to use a similar method for arranging the buttons. If you note carefully at the PCB, you'll see that each button is made of two traces, but that all of the buttons share one trace together. Note that this is really just a symbolic schematic, the ground wire doesn't necessarily connect on the side thats indicated, we're just showing how all the buttons have a common ground pin! OK now this is straight forward, if you are not sure how to read buttons with a microcontroller, we have a nice tutorial you might want to check out (in fact, we really suggest it as we'll be referring to concepts in that tutorial) Basically each button connects to an input of the microcontroller. We'll need a pull-up resistor, but luckily we can set the microcontroller's internal pullups (so we dont have to solder in 12 10K resistors!) Then the microcontroller can listen on each pin for a button press and when it is received, generate a keypress event. The Arduino is a USB serial port - it appears under Ports here, not under Keyboards! OK we're basically ready to go. The plan is to solder a single Ground wire to the common ground for all the buttons, then solder a seperate wire to each button (the not-ground side). The ground connects to the Teensy ground, the button wires connect to all the solder pads down the side. Then we'll write the code that listens to the button presses and converts them. Cut off a strip of ribbon cable, about 4" long. Use diagonal cutters or fingernails to carefully nip and 'rip' the individual wires apart about 1" and then strip the ends and tin them with solder. Do this for both sides. I made this cable about 1" too long initially, but its always easy to make the cable shorter! To connect to ground, we'll expose a little copper in the top left corner, this way we don't have the wire running underneath the elastomer. Solder the Black wire to the ground plane, we brought the wire through a hole. OK lets solder to the first button. The key is to remember to NOT solder to the same common pad but to the opposite pad! Solder the white wire to the 'up' button. There's almost always a hole you can feed the wire through! Solder the gray wire to the Right pad, the purple wire to the Down pad and the blue wire to the Left pad. Then the orange wire goes to the L1 button, the yellow goes to Start and the green to Select. I didnt end up using the Red or Brown wires so I tore those off the ribbon. Now cut another piece the same size but with only the white, gray, purple, blue and green wires. Connect white to B, gray to A, purple to X, blue to Y and green to R1. If you haven't yet, now is a good time to desolder the SNES connector cable. We wont have space for it so just pull each wire as you heat the solder joint (or just cut them short, either way). OK! Now all the buttons are wired up, its time to attach them to the Teensy. Place the Teensy in a vise or carefully use a 'third hand' to hold it (grab by the USB connector). First, solder the black wire to the ground pin. Next start soldering in all the ribbon cable wires, one after the other, without skipping any holes. After the first ribbon cable, go to the second piece, starting with the white wire. The last green wire goes next to the blue one on the 'short' side. The Teensy uses the USB connection for programing, so we don't need a seperate AVR programmer. We will use the Teensyduino IDE, which is a patch to the Arduino IDE. Finally, be sure to also grab Teensyloader which is a helper that talks to the Teensy for you. //It enables a pullup resitor on the pin. 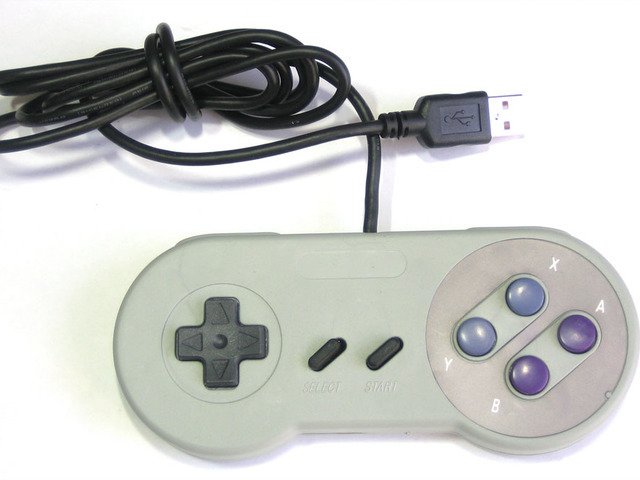 //Progess the SNES controller buttons to send keystrokes. //Assign temporary values for the buttons. //Remember, the SNES buttons are read as active LOW. //Send all of the set keys. Now we'll upload this sketch to the Teensy. Make a new sketch and copy the code in. 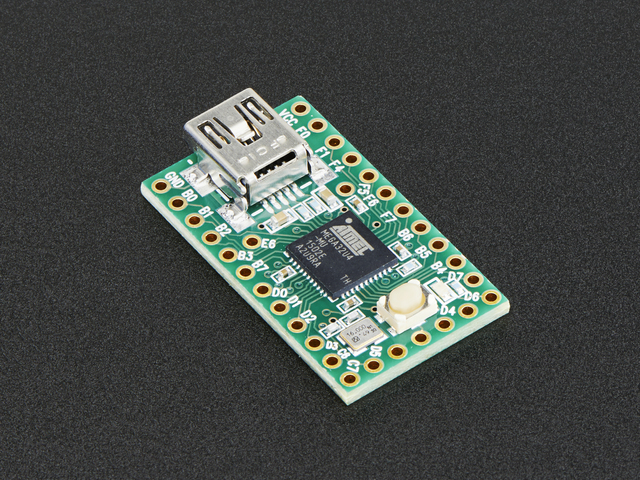 Select the Teensy 2.0 (USB Keyboard/Mouse) item from the Board menu. Upload the sketch! You should see it sucessfully program the Teensy, and reboot. The OS will then alert you that it found an HID device. And the device manager will now have an extra Keyboard and Mouse called "HID Keyboard Device" and "HID-compliant mouse"
This code is more involved since it has to listen to 12 buttons. You can see at the top where we define an array of all the buttons, and then the keys that correspond to the presses. In this case, we're using a simple one-to-one correspondence for keypresses, such as Up being 'u'. To adapt this code to allow for things like "Alt-F3" would be a little more complex. We have recently updated the code to support up to 6 simultaneous keypresses. Cut a piece of ribbon cable down, we'll use Brown for Ground, Red for +3V, then Orange Yellow and Green for X Y and Z respectively. We tore the brown wire off so that it wouldnt be twisted. 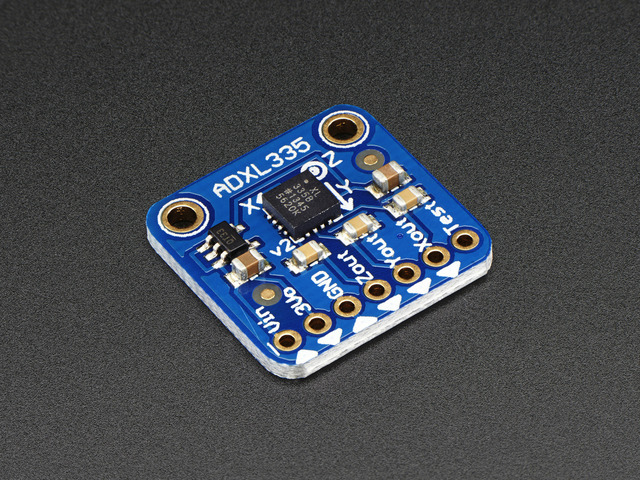 The ADXL335 requires 3V power, so don't connect it to VCC (5V) instead, we'll use the 3V that the teensy provides - it uses that voltage for the USB communication, you can't draw more than maybe 20-40mA which is plenty for this but not enough for perhaps a bunch of LEDs! Brown connects to the second GND pin. One thing that will help is 'deribboning' the ribbon cable, so that it is easy to push around the wires. Use sticky foam tape or hot glue to place the Teensy right at the top. Likewise, align the acellerometer so that it is as shown (otherwise you may have some flipped axes. You should put it near the middle but we didn't see any difference being in this location. 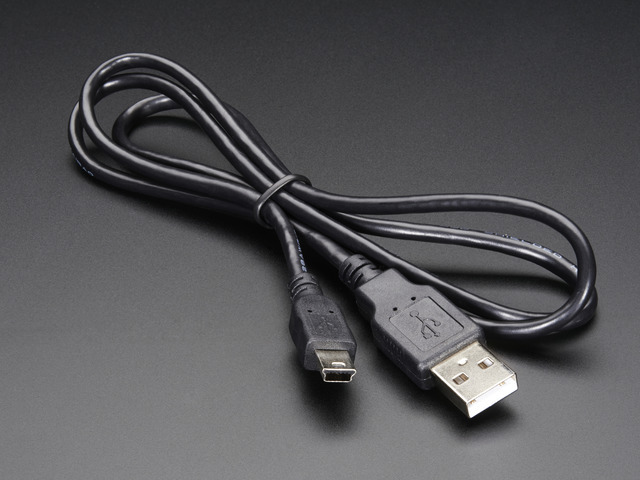 Finally, twist the USB cable so that it goes through the strain relief posts. If this makes it really tough to close you can probably skip it and just be careful not to yank! We wanted to make sure we could update the code without going through the disassembly process, so we drilled a hole in the back right over where the button is, then used a paper clip to push the tiny button. You can also just solder two wires to GND and RST and bring these out of the case, when shorted it will start the bootloader. You're done! Enjoy your new toy, and modify the sketch if you need to change the keycommands or mouse movements. Cut the cord and build your own wireless bluetooth game pad!